Loving Moore: SHEMAR MOORE ~ Let Me Be Me! 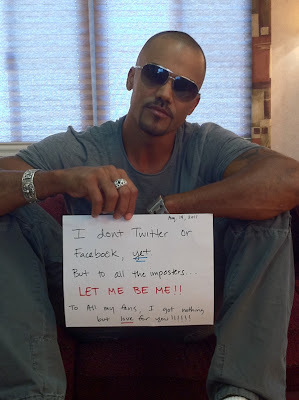 For the second time in as many months, "Criminal Minds" star, SHEMAR MOORE, has let his fans know that he does not have a FaceBook account, and does not Tweet. Responding to the endless questions sent to the CM cast and crew that does "tweet," SHEMAR sent this message to his fans on August 19, 2011. "I don't Twitter or Facebook, yet. To all my fans, I got nothing but love for you!!!!!" Oh, SHEMAR! We will so let you be you. Of course, now that you have given fans hope by saying "yet," your "Criminal Minds" friends are going to be deluged with questions about "when" are you going to join FaceBook and Twitter. Unfortunately, SHEMAR, you can't win.